Our Large Churrasco Skewers are best for larger cuts of meat; for example, flank steak or Cupim (hump). ✓ The wooden handles are crafted of Maple. ✓ Ideal for cooking outdoors. 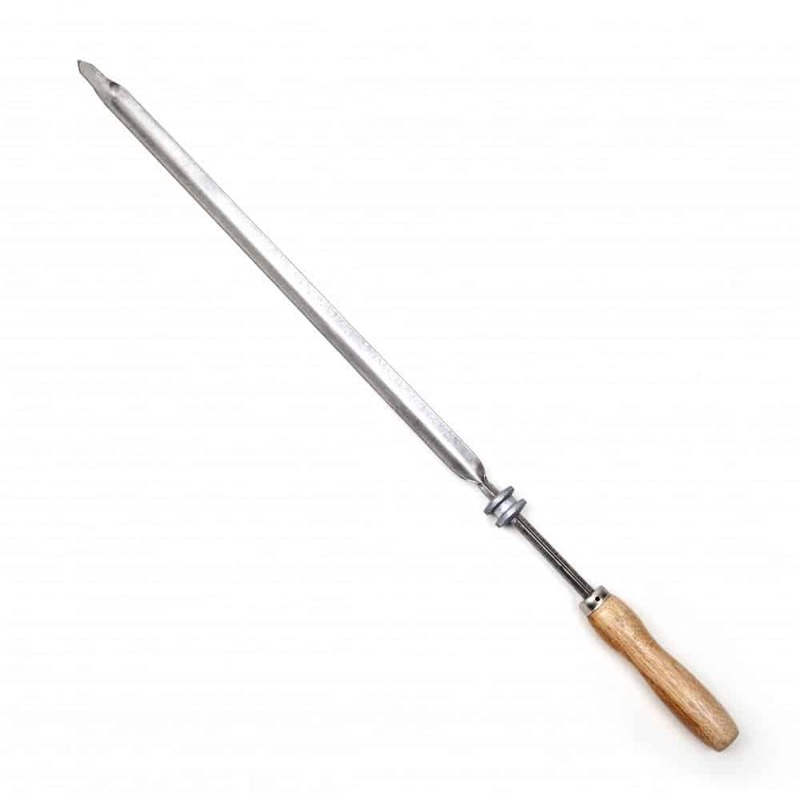 The Large Churrasco Skewer is also optimal for cooking anywhere that you wouldn’t have access to pots and pans, for example, on a family camping trip, or picnics. Most steaks fit rather nicely on our large skewer. The Large Churrasco Skewers are a fun, simple way to serve people delicious meat. The skewers allow you to carve off food when it is finished cooking to serve to your guests, and then place it back over the heat to keep warm. The Large Churrasco Skewers are also optimal for cooking anywhere that you wouldn’t have access to pots and pans, for example on a family camping trip. Most steaks fit rather nicely on our large skewer. The Large Churrasco Skewers are a fun, simple way to serve people delicious meat. The skewers allow you to carve off food when it is finished cooking to serve to your guests, and then place it back over the heat to keep warm. Michael Chiarello’s new book about cooking over open flame featured Churrascoshop.com Skewers and Grills. Titled “Live Fire” and released in April 2013, it showcases many of the compelling applications of Brazilian and Argentinian barbecue and shows off several of our products. Additionally, it showcases the most authentic manner of using Brazilian skewers in everyday cooking. Michael Chiarello is an Emmy award-winning television host, Top Chef Master, former Iron Chef, and a master of cooking meats over a fire.